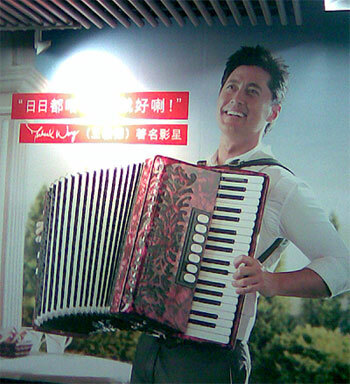 By popular demand, I am now posting a photo of Michael Wong playing the accordion in his second ad for HSBC. Not even death can stop Stone Wong. his accordion to lull terrorists into submission. The magic of mobile phone technology made this possible. Frankly, I completely forgot that this photo was taken, thereby proving the existence of Edison Chen Syndrome™, where you get so used to your technology that you take it for granted. In my case, I simply forgot that this photo existed. In Edison’s case, he forgot that someone could violate his encrypted pink Macbook and subsequently destroy the Hong Kong Entertainment industry. “Dammit, Edison! Don’t you remember the basic rule of technology? Even though Michael Wong barely makes films nowadays - his appearance in Tsui Hark’s Seven Swords could qualify as his last memorable screen role - the man is still around. Currently, he’s shilling for HSBC, one of Hong Kong’s two biggest banks, in print ads all over the territory. This picture is from a magazine, but if you happen by the Tsimshatsui MTR station, you may be able to catch a larger-than-life glimpse of Wong, as this image measures a good fifteen feet high on the MTR walls. 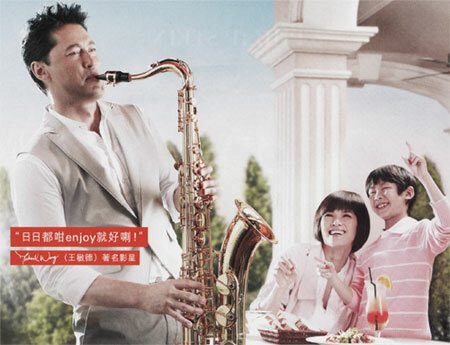 There’s also an alternate ad of Wong playing the accordion. No further commentary is necessary. In other Wong news, you can catch Michael’s brother Russell in The Mummy: Tomb of the Dragon Emperor, currently losing screens all over North America. Buy CJ7 now! No waiting, no hassle, and maybe no movie. Everybody loves CJ7. That is, except the people who didn’t like it. There are actually quite a few, judging from the film’s lukewarm-to-positive response both locally and on the web. 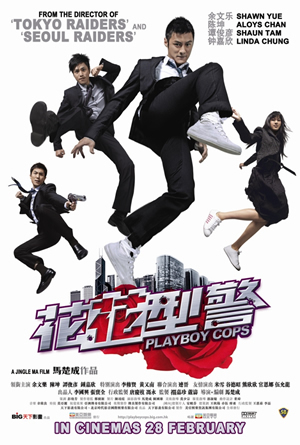 Personally speaking, the movie isn’t great nor is it terrible; its worst offense is that it’s simply a bit of a let down, especially considering that it’s Stephen Chow’s first movie in 3 years and that he really isn’t in it very much. Not sure why he should care though. The movie is making bank. And man, that CJ7 is one cute critter. What’s in this blurry photo that I took with my mobile phone? 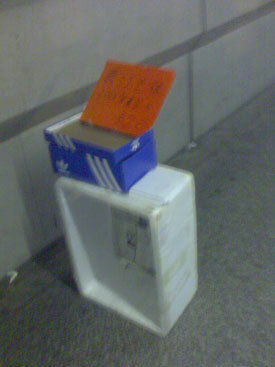 Why, it’s none other than a shoe box where you can deposit 20 Hong Kong dollars voluntarily. Afterwards you can take one of the paper-sleeved VCD copies of CJ7 the nice people who set up the box have left next to the shoe box. Whether or not it actually contains a copy of CJ7 is a good question. It could be just a trailer, or maybe a blank CD. Worst case scenario: it’s a copy of Wonder Women. Sadly, the above disc is genuine. It’s been stuffed in the dirt to ward off birds at a local community garden. One would think that using tinfoil or some other form of shiny, bird-repelling trash would work just as well, but nope, they’re using Hong Kong movies to keep birds from eating their flowers. At least the movie they’ve tossed is Rules of the Game, a nineties triad movie that would never qualify for a classic genre retrospective. It could be worse. They could be misusing a good movie like, say, Benny Chan’s excellent nineties actioner Big Bullet. What does all this show us? Probably what most of us already know: that people in Hong Kong don’t really value entertainment, much less the media its encoded onto. 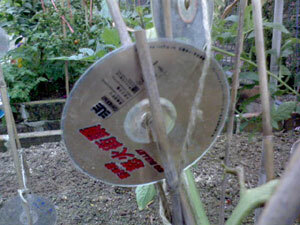 An old VCD is worth more as a makeshift scarecrow than it is as a form of entertainment. 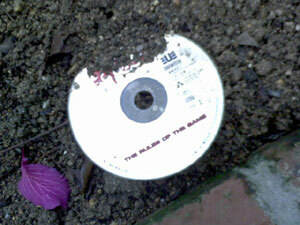 Sadly, the same garden also contained some discarded DVDs, including a little movie called The Fellowship of the Ring, so this poor respect for the creative work of others applies to movies from pretty much anywhere. 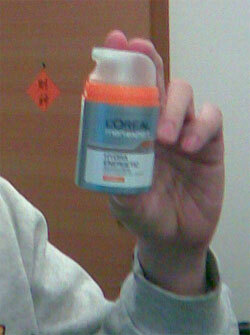 It’s just disposable junk to a lot of people in Hong Kong, and is not worth more than 2 hours of braindead time. Apparently, over 10,000 wasted man-hours devoted to media hype and celebrity scandal are far more valuable and necessary. Man, I’m depressed. 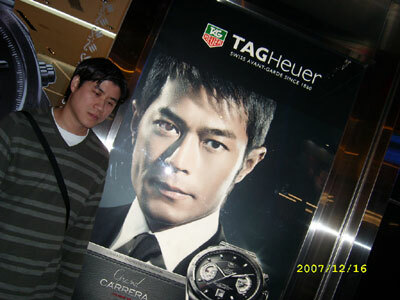 Not even Louis Koo hawking watches can make me feel better.